• The capital gains credit lowers the effective tax rate for households who make money from investments compared to those who earn income from wages. • Montana is one of only nine states that offer a tax break for capital gains income. • Over 50 percent of the tax break went to the wealthiest 4,500 households in Montana (those earning more than $365,000). More than 85 percent of taxpayers (more than 468,000 Montanans) did not benefit from the capital gains tax credit. • In 2013, the capital gains tax break cost the state nearly $30 million in revenue. • Rolling back the capital gains tax break would free up new revenue to support growth-oriented public investments, like education, work support, and infrastructure improvements. • Numerous economic studies have shown that there is little connection between favorable treatment for capital gains and economic growth in either the short or long run. In 2003, the Montana Legislature passed a capital gains tax credit that benefits a very narrow portion of our population at the great expense of our collective ability to adequately invest in public programs, from education to health care. Currently, Montana is one of just nine states offering a significant tax break for capital gains income. Since 2003, this tax break has proven to be unaffordable, unfair to working-class Montanans, and has harmed the economy. In fact, the tax credit costs the state tens of millions of dollars in state revenue each year. This reduction in revenue jeopardizes our collective ability to invest in schools, families, and communities all across this state. It’s time to take a hard look at the usefulness of this costly tax break that predominantly benefits the wealthiest Montanans. Capital gains are profits from the sale of stocks, bonds, real estate, art, antiques, or other assets. These profits are usually not taxed until they are “realized,” that is, until the asset is sold. This means that a stock or vacation home can become more and more valuable, but the investor will not pay taxes on the appreciation of that asset until it is sold. The capital gains are calculated by taking the difference between the original purchase price and the price at the time of sale. The assets owned by everyday Montanans – houses and retirement income – are generally exempt from taxation when sold. How Does Montana Treat Capital Gains? In 2003, the legislature passed Senate Bill 407, which created the capital gains tax credit, and also instituted other tax cutting provisions. The credit lowered the effective tax rate on capital gains by giving a nonrefundable credit starting in 2005. Montana is one of only nine states that provide this tax break for income from investments. While the federal tax codes provides a lower rate on capital gains income, nearly all states require equal treatment of income from capital gains as income from wages. The creation of a tax break for capital gains income has created a tax system that favors wealth over work. Capital gains tax breaks mean individuals with incomes from wages pay higher tax rates than people whose income comes from growth in assets. Chart 1 illustrates the different taxes paid by two individuals with the same amount of income. In 2015, a firefighter in Montana earned an annual wage of $47,050. Compare this taxpayer to an investor who earned the same amount, but through the sale of stock. The firefighter paid $2,240 in state income taxes, and the investor paid $1,299. The investor paid $941, or 42 percent, less in taxes than the firefighter. Only a small number of Montanans can take advantage of the capital gains tax credit. In 2014, half of the capital gains tax cut went to the wealthiest 4,500 taxpayers (those earning more than $364,000). In 2013, over 85 percent of Montana taxpayers – more than 468,000 taxpayers – did not receive any benefit from the capital gains tax credit. 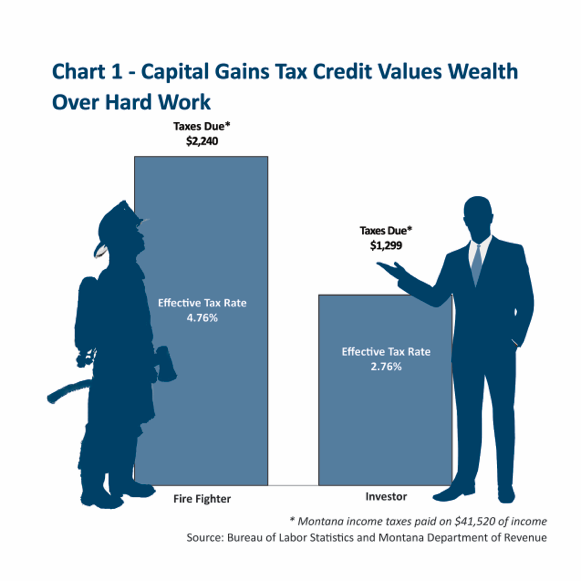 Middle- and lower-income Montanans do not benefit from the capital gains tax credit because they are much more likely to earn their income on the job rather than through large sales of assets. Furthermore, the most common assets owned by most Montanans—houses and retirement funds—are generally not treated as taxable capital gains when they are sold. Additionally, profits from capital gains have increased significantly since 2001. From 2001 to 2005, capital gains income by Montana taxpayers almost doubled, to over $1.5 billion. By 2005, capital gains represented nearly a quarter of total income accrued by those making more than $150,000 (less than 14,000 taxpayers). While capital gains income has increased over the past decade, the state loses out on its full opportunity for needed additional revenue as a result of the capital gains tax break. The capital gains tax credit has proven to be unaffordable and hurts our ability to fund services like education, health care, infrastructure, and clean air and water. When SB 407 passed, the legislature expected the bill to cost $26 million in 2005, the year its provisions went into effect. In fact, the combined tax cuts passed in 2003 cost the state $100 million in 2005. In a little more than a decade, Montana has lost approximately $976 million in revenue from the tax cuts from 2003. A major portion of the continued revenue loss is attributed to the capital gains tax credit, primarily benefiting the wealthy. By 2007, the cost of the capital gains tax break reached $40 million per year. While earnings through capital gains dipped during the recession, these earnings have been growing since 2012, representing a significant loss in revenue year after year. In 2013, the state lost nearly $28 million in revenue as a result of the capital gains tax loophole. This level of revenue could have been used to invest in quality early childhood education, providing preschool for over 7,300 four-year-olds in Montana and a better opportunity to succeed. Tax credits are an expense to the state; giving people who sell assets a tax break means the state collects less money. However, unlike the cost of spending on public services which is more stable and benefits everyone, the cost of the capital gains tax credit to the state is difficult to predict, impossible to control, and benefits only a few. For example, when Montana decides to invest in higher education, the legislature decides the amount the state contributes to universities, community colleges, and technical training centers. In contrast, the full cost of the capital gains credit to the state depends solely on individuals’ decisions to buy or sell assets, and is therefore effectively unlimited. Economic theory and experience indicate that treating capital gains more favorably than earned income will not help the economy grow, and may actually prevent growth in the short-term by forcing state budget cuts. In contrast, rolling back this tax break would restore revenue to help support growth-oriented public investments, like education, work support, and infrastructure improvements. Furthermore, Montana should create a level playing field for those earning income through wages, thus creating a greater incentive for businesses to invest in the creation of good-paying jobs. The capital gains tax credit favors investment in capital over investment in labor, creating potential distortions in investment decisions. As Montana faces continued workforce shortages, we cannot afford policies that might further reduce investment in human capital. In addition, Montana’s capital gains tax credit does not distinguish between in-state or out-of-state capital investments and therefore does not create incentives to invest in Montana. In fact, taxpayers can claim the credit when they sell the stock of a company that has never done business in our state. To make matters worse, Montanans don’t get the full benefit of the credit. Rather, the state credit leads taxpayers to pay less to Montana and more to the federal government. Because state income taxes are deductible on federal tax returns, when taxpayers pay less to the state, they pay more to the federal government. In the case of Montana’s capital gains tax credit, 12% of the tax benefit goes directly to the federal government. Montana forgoes $34 million a year to pay for the capital gains tax credit. However, Montana taxpayers only capture $30 million of this tax cut. Lower state income taxes result in higher federal income taxes for people who itemize their deductions, because taxpayers can’t claim as large of a deduction for state and local income taxes paid. As a result, the state effectively transfers about four million of the $34 million in lost revenue to the federal government. In an analysis of the impact of the 2003 legislation, comparing economic growth in Montana to surrounding states, Montana Budget and Policy Center found, at most, negligible evidence that the economic growth Montana experienced over the past decade could be attributed to tax cuts. MBPC measured whether the 2003 tax cuts had a statistically significant change in the actual growth in Montana’s economy by comparing the state’s economy with regional data in such areas as the unemployment rate, income per capita, jobs, wages, or gross state product, several years out. Instead, Montana continues to lose nearly a hundred million dollars in revenue each year that could instead be invested in our local communities. Because tax breaks on capital gains benefits a small percentage of the wealthiest households, who are more apt to save this money rather than spend it in local economies, studies show very little economic impact of these tax cuts. Mark Zandi, chief economist of Moody’s Analytics has noted that efforts to provide tax cuts for capital gains income provides one of the lowest impacts on economic growth, as compared with improving policies that help low- and moderate-income families. Dozens of highly credible economic studies around the country show that there is little connection between cuts in individual income taxes for the wealthy and economic growth in either the short or long run. A comprehensive review conducted by the Center on Budget and Policy Priorities noted that of the 15 major academic studies on income tax cuts conducted since 2000, over 75 percent found no significant economic effect of these tax cuts. Since enacting the cuts, most states have actually seen slower job growth than the nation as a whole and have seen their share of national employment decline. Rather than continuing the failed policy of tax cuts, our best opportunity to realize economic growth in Montana is to invest in our communities, through strengthening support for K-12 education, expanding access to post-secondary education and training, supporting families struggling to make ends meet, and increasing good-paying jobs and business growth through investments in public infrastructure. One of the best ways we can ensure adequate state revenue and begin to properly invest in our communities is by ensuring that Montana’s wealthiest households pay their fair share. Now, more than ever, Montana needs to invest in ways that build our workforce and our economy. Our best opportunity to realize economic growth for all Montanans is through investments in our communities across the state. There are fair and effective ways to raise the revenue needed to pay for these public investments. They include ending tax cuts and loopholes that benefit the wealthiest. Since its passage in 2003, the capital gains tax credit has cost Montana hundreds of millions of dollars that could have been invested in schools, families, and communities all across this state. Only a small percentage of Montanans benefited; more than half of the benefit went to the wealthiest 4,500 households. Meanwhile, the vast majority (over 85 percent) of Montana residents do not receive any benefit from this tax break, and instead pay a higher effective tax rate on income from wages. Continuing preferential treatment for capital gains income is unfair to hardworking Montanans who earn their income through wages and salaries. We can no longer afford such a costly credit that benefits so few households. Taxing investment income like we tax income from wages will help us to create jobs and protect our land, people, and the services that make them stronger. See Institute on Taxation and Economic Policy. The Folly of State Capital Gains Tax Cuts. September 2011. Arizona implemented a preferential rate on capital gains in 2012, following the publication of ITEP’s report. Income Tax Reduction with Revenue from Limited Sales Tax, SB 407, Montana Legislature, 58th Session, 2003. http://leg.mt.gov/css/default.asp. Bureau of Labor Statistics. “May 2015 State Occupational Employment and Wage Estimates: Montana.” http://www.bls.gov/oes/current/oes_mt.htm#00-0000. Author’s calculation. “Individual Income Tax Parameters.” Montana Department of Revenue. 2015. Retrieved May 2016. http://revenue.mt.gov/Portals/9/individuals/forms/2015_IITRates.pdf. Montana Department of Revenue. “Top 1% of Households, Total Income, Tax, and Capital Gains Income.” Accessed June 2016. Data on file with author. Montana Department of Revenue. “Biennial Report: July 1, 2012 – June 30, 2014.” December 2014. http://revenue.mt.gov/Portals/9/publications/biennial_reports/2012-2014/BiennialReport-2012-2014.pdf. ITEP. 2011. A capital idea: Repealing state tax breaks for capital gains would ease budget woes and improve tax fairness. Washington DC. “Explaining the Difference Between the Forecast and Actual Impacts of Senate Bill 407 (2003 Legislative Session).” Montana Department of Revenue. January 2007. Montana Department of Revenue. 2006. The revenue and taxpayer impacts of the income tax provisions of sb 407. Helena. “Montana Personal Income Tax Revenue Lost, 2005-2016.” Institute on Taxation and Economic Policy. April 2016. On file with author. “Biennial Report: July 1, 2006 to June 30, 2008.” Montana Department of Revenue. January 13, 2009. https://revenue.mt.gov/Portals/9/publications/biennial_reports/2006-2008/BiennialReport_2006-2008.pdf. “Biennial Report: July 1, 2012 – June 30, 2014.” Montana Department of Revenue. December 2014. http://revenue.mt.gov/Portals/9/publications/biennial_reports/2012-2014/BiennialReport-2012-2014.pdf. 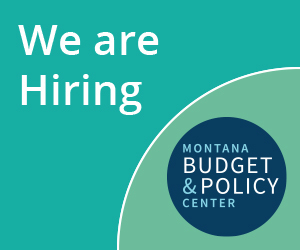 See Montana Budget and Policy Center. “Strengthening Families, Strengthening Our Economy: The Economic Benefits of Pre-Kindergarten.” September 2014. http://www.montanabudget.org/economic_benefits_of_pre-k/. We estimate that an annual investment of $26.7 million would provide a universal pre-K program for all four-year-olds in Montana, factoring in current enrollment within Head Start and estimated enrollment level of 75 percent. Institute on Taxation and Economic Policy. “The Folly of State Capital Gains Tax Cuts.” August 2016. http://itep.org/itep_reports/pdf/Capital%20Gains-2016.pdf. Institute on Taxation and Economic Policy. Impact of repealing montana's capital gains tax credit. 2016. On file with author. Dennison, Mike. “Tax cuts led to surplus, GOP says.” The Missoulian. February 19, 2006. http://missoulian.com/news/state-and-regional/tax-cuts-led-to-surplus-gop-says/article_103e8207-732b-5162-b5f1-cd8f52013e53.html. “Senate Bill 407 Did Not Expand the Economy.” Montana Budget and Policy Center. March 19, 2009. http://www.montanabudget.org/senate-bill-407-did-not-expand-the-economy/. Institute on Taxation and Economic Policy. “A Capital Idea: Repealing State Tax Breaks for Capital Gains Would Ease Budget Woes and Improve Tax Fairness.” January 2011. (citing Zandi, Mark. “Testimony before the US House of Representatives Committee on the Budget.” January 27, 2009.). Leachman, M., Mazerov, M. “State Personal Income Tax Cuts: Still a Poor Strategy for Economic Growth.” Center on Budget and Policy Priorities. May 14, 2015. http://www.cbpp.org/research/state-budget-and-tax/state-personal-income-tax-cuts-still-a-poor-strategy-for-economic.